Ventilation is key to proper operation of your equipment and it also extends the life of the equipment. No one wants to come home to a dark house! With lighting control you don’t have to. Most of us have seen basic lighting control, the little box you plug a lamp into and set the pegs for an ‘on time’ and ‘off time’. The problem with these are the light never turns on or off at the right time. 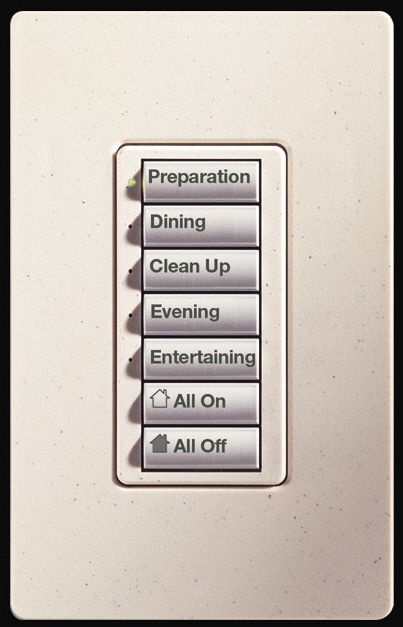 With a real lighting control system the lights always turn on at dusk, even after daylight savings time. You can change the feel of a room with the press of a single button. The lights can be bright for cleaning, dimmed for evening reading, or just a warm glow for conversation or watching a movie. Lighting control can be as simple as controlling the lights in one room, or the light switch wall clutter can be removed throughout the whole house with a complete system. Keypads can be placed in convenient locations through out the home, improving the look and ease of use. A lighting control system can be planned at the design stage of a project or it can be installed in any existing home without cutting holes and running additional wiring.